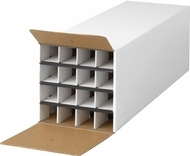 Storing documents is convenient at any budget level with our Economy Document Storage Products. A range of options and sizes, from a two level art rack to an art and drawing portfolio to a steel reinforced stack tray, help take cluttered offices or work space and make organization easy. All come with a classic appeal and contemporary look.